“Leave the beaten track occasionally and dive into the woods. FOR AT LEAST 7000 YEARS, architects and builders around the world regarded the 90° right angle as the bedrock geometry of architecture. 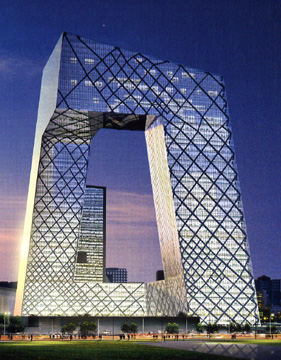 Conventional construction demanded the use of the consistent and convenient square corner. 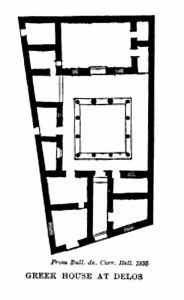 The floor plans in the ancient Persian complex of Persepolis, for instance, rigidly employ the right angle as its cardinal geometry. 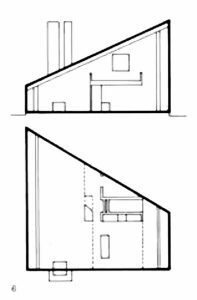 Although vertical walls and square corners were the norm, occasions arose when a builder was forced to consciously depart from orthogonal (right angle) geometry. Irregular site conditions, such as an intersection where the streets are not perpendicular, forced a builder to create spaces that were not pure rectangles. 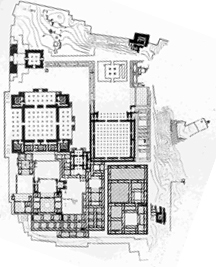 The Greek house illustrated on the right shows a plan that ideally would have had all right angles except that site conditions in the non-orthogonal ancient city of Delos presumably demanded two exterior walls to be canted. In light of this history, it came as a surprise when, during my senior year (1961-62) in the School of Architecture at the University of Pennsylvania, I noticed that fellow students were adding chisel-shaped extensions to their otherwise rectangular plans. These were similar to the geometry in a 1963 house by New York architect Edward Larabee Barnes. At the time, these triangular extensions seemed slightly perverse, yet alluring. 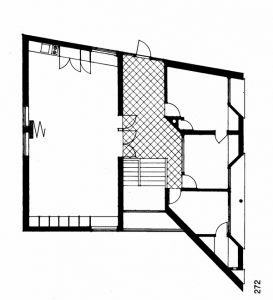 Floor plan and cross section of a house designed by Edward Larabee Barnes, 1963. This new geometry appeared to be a reaction against conventionality. This expression of angularity dovetailed with cultural developments of that era, mirroring profound changes in American culture in the early 1960s. An anti-establishment and anti-convention upheaval was beginning to reveal itself throughout the nation and indeed in other communities throughout the world. This period was marked by protests and social turbulence. People sought to shed convention and bristled at the rigid order of things. A new geometric patterning that felt like it slashed across the orthogonal grid ushered new life and forms into an architecture ripe for change. Anti-orthogonal architecture became something of a banner waved by those advocating and practicing a radical departure from traditional design. This defiant and emerging geometry perfectly suited what was becoming, for some, the psychedelic and experimental behavior of that stormy era. The use of diagonal shapes and angular relationships during this time was, on a personal level, both puzzling and fascinating. Something new and compelling was in the air, something daring and ripe with the potential for foundational change. Oddly, no one was discussing this sweeping transformation. 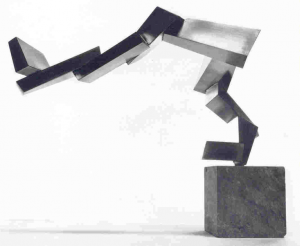 Study for a sculpture for an architectural setting, James Rosati, 1965. Inexplicably, the pervasive use of Diagonality escaped recognition and serious discussion by design professionals, scholars, and critics, except in rare instances. 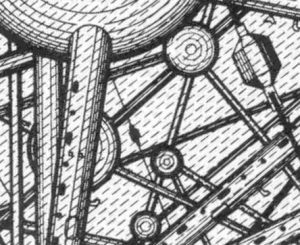 How was it possible that something as significant as Diagonality could be overlooked and under-examined for all these years? For the last half century, I have engaged in numerous exchanges with designers around the world and amassed a significant body of research materials. This mounting collection of evidence provided repeated confirmation that Twentieth century art and architecture had undergone a dramatic transition as indicated by how we designed buildings, drew pictures, decorated vases, engineered bridges, planned cities and gardens, and even configured jet fighters. 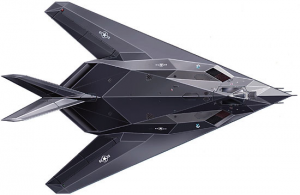 F-117A Nighthawk Stealth Combat Aircraft. US Air Force, Lockheed Martin. Circa 1982During the three years of my professional apprenticeship, I couldn’t help but observe that the diagonal was undeniably influencing the architectural geometry of buildings constructed across the country and indeed around the world. 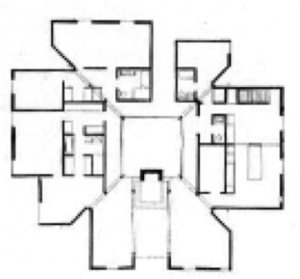 The Goldenberg House, designed by visionary Philadelphia architect and Penn professor Louis I. Kahn, is an example of Diagonality impacting orthogonal design. By the late 1970s, it was unusual to find almost any significant new building that did not incorporate some form of Diagonality. Moreover, some designers had embraced diagonality as the dominant expressive motif in their work. Adult Learning Research Center, Bryn Mawr, Pennsylvania designed by Romaldo Giurgola. Grammar school design project, Joel Levinson, University of Pennsylvania. 1960Robert Venturi, another member of the Philadelphia School and one of my professors at Penn, assigned a class project to design a grammar school. 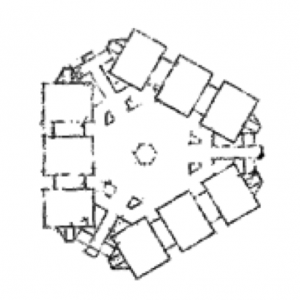 My scheme consisted of three classroom wings in a triangular configuration, defining an open- air courtyard in the middle. Each wing ended with rectangular stair towers and toilet cores. 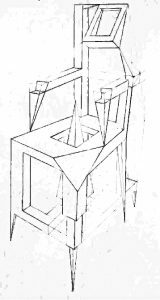 In the spirit of designs being developed in his own office, Venturi suggested that wedge-shaped ends to each classroom wing be considered rather than the clashing rectangular forms I had drawn. This approach extended the triangular theme albeit in a truncated form. The wings now dovetailed with one another in a more geometrically satisfying fashion. Venturi was at the time finalizing his landmark book Complexity and Contradiction in Architecture in which he frequently refers to diagonals in the works of other architects. But he had not thematized these references into the broader notion of Diagonality. Despite a fascination with the emergence and formalities of diagonality, this oblique geometry did not come naturally to me. In 1989, all that changed when a client engaged me to design a house with many angles and curves. I embraced the assignment and discovered that I could successfully employ diagonality throughout the design. Kimball Residence, 1989, Joel Levinson, architect. 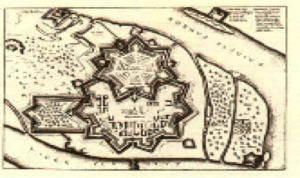 Mannheim, Germany, fortress plan and citadel, 1606In the years after graduating I collected hundreds of articles that reflected examples of Diagonality in architecture, city planning, and the arts in general. I actively searched for cultural developments that might relate to and help illuminate this emergent phenomenon. The cumulative effect of my research and creative analysis led me to the inevitable conclusion that Diagonality should be regarded as the Signature Geometry of the Twentieth Century.